We offer pelvic health physiotherapy at two of our locations, Kitchener-South and Cambridge. Patients can expect comfortable, private rooms where discretion is prioritized. Our physiotherapists are knowledgeable in musculoskeletal as well as pelvic health physiotherapy to provide a comprehensive, whole-body approach. We strive for a caring and compassionate environment where everyone is welcome. “Common” = “Normal”– NOT true! Leakage of any kind, at ANY age is common but NOT normal. Physiotherapy can help address this. Kegels are good for everyone- NOT true! Most people are hypertonic and therefore need to work on relaxation of tissues before strengthening occurs. 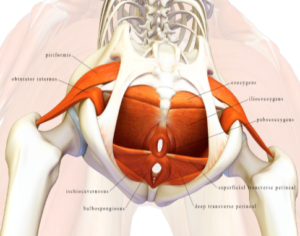 Pelvic Physiotherapy only treats incontinence- NOT true! We can address a number of pelvic issues. People don’t want to talk about this area- NOT true! The prevalence and impact on quality of life is so high, it is crucial that we as health care professionals make discussions around these issues comfortable and normalized. Includes external and, if consented to, a vaginal and/or rectal exam to assess for pain, tissue resistance, scarring, strength and coordination. For more information, please contact our Cambridge or Kitchener-South locations.